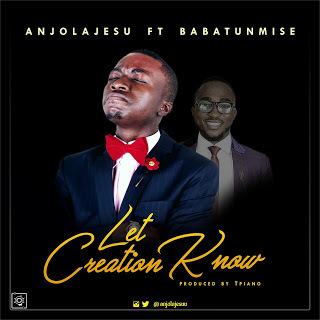 Following the amazing testimonies received from his previous songs - 'Immanuel' and 'Sound D' Alarm', young and dynamic Gospel music minister, Omotoso AnjolaJesu AdeOluwanimi, an undergraduate of the University of Ibadan, is not resting on his oars as he drops another highly anticipated new single - 'Let Creation Know'. AnjolaJesu has proved that he is a rare and versatile Gospel artiste and he teams up with the 'Ogo Ola' crooner, Babatunmise popularly known as Ibadan Priest Of Praise. The duo integrate their different but unique music styles in this masterpiece song. 'Let Creation Know' is a song of supplication that describes the incredible power of the living God and further seeks that undeniable miracles cover the earth. All over the universe, men must know that all power belongs to Jesus. The supernatural must be a norm.